We "must unite with one mission: that no one will ever be murdered in school again," Mast says. 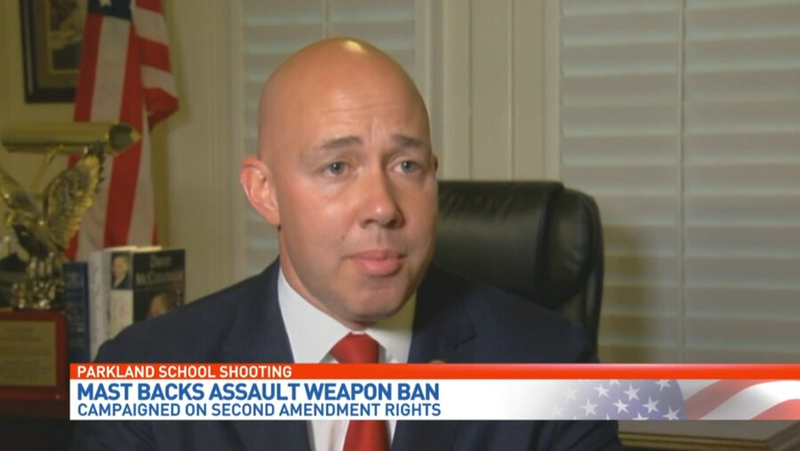 WASHINGTON – Congressman Brian Mast, R-Palm City, has as much authority on guns as anyone, having served in the Army and losing both legs in Afghanistan. He says assault weapons such as the AR-15 should be banned. "I cannot support the primary weapon I used to defend our people being used to kill children I swore to defend," Mast, who represents a swing district and faces a tough re-election, writes in an op/ed for the New York Times. "The Second Amendment is unimpeachable. It guarantees the right of citizens to defend themselves. I accept, however, that it does not guarantee that every civilian can bear any and all arms. "For example, the purchase of fully automatic firearms is largely banned already, and I cannot purchase an AT-4 rocket, grenades, a Bradley fighting vehicle or an Abrams tank. I know that no single action can prevent a truly determined person from committing mass murder, and I am aware of other ways to commit mass murder, such as bombings and mass vehicular slaughter. Not being able to control everything, however, should not prevent us from doing something." Mast outlines a proposal that includes, "Defining what constitutes an assault or tactical firearm and not allowing them for future purchase — just as we already prohibit the purchase of fully automatic firearms. The exact definition of assault weapon will need to be determined. But we should all be able to agree that the civilian version of the very deadly weapon that the Army issued to me should certainly qualify. I would not support any version of a ban that results in confiscating existing legally owned firearms."